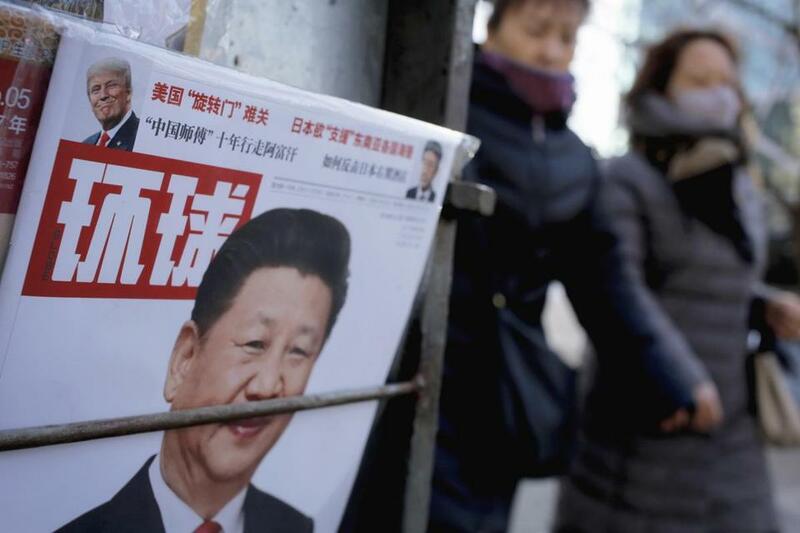 Women walked past a newsstand displaying a Chinese magazine fronting a photo of Chinese President Xi Jinping and US President Donald Trump in Beijing on Thursday. WASHINGTON — When the White House announced this week that President Donald Trump had sent President Xi Jinping of China a letter wishing him a happy Chinese New Year, it did not disclose a major reason for the friendly gesture: Xi has not gotten on the phone with Trump. Stung by Trump’s unorthodox telephone call with the president of Taiwan and his subsequent assertion that the United States might no longer abide by the “One China” policy, Xi has not spoken to Trump since Nov. 14, the week after he was elected. Administration officials say they believe he will only do so after Trump publicly commits to recognizing a single Chinese government in Beijing. The letter, which the White House took the unusual step of releasing publicly on Wednesday, was an effort to keep the US-China relationship from unraveling further, several officials said, especially as Trump is about to welcome Japan’s prime minister for an extravagant three-day visit that will include a weekend of golf in Florida. Relations between Washington and Beijing have been frozen since December, when Trump took a congratulatory phone call from Taiwan’s president, Tsai Ing-wen. The United States has not had diplomatic relations with Taiwan since 1979, but Trump defended the call by saying he did not know why the United States should be bound by the One China policy. To lay the groundwork for a better relationship, Trump’s national security adviser, Michael T. Flynn, spoke last Friday to China’s top foreign policy official, Yang Jiechi. That call produced only a vague commitment to “reinforce high-level exchanges,” suggesting that Trump’s statements on China still precluded a direct leader-to-leader exchange. “This letter means they’re looking for creative ways to stabilize this relationship when Trump and Xi can’t talk due to differences over Taiwan policy,” said Evan S. Medeiros, who was senior director for Asia in the National Security Council in the Obama administration. There are indications the administration recognizes it may need to do more. On Thursday, Secretary of State Rex W. Tillerson was at the White House for meetings to discuss whether the White House should publicly reaffirm its commitment to the One China policy as a way of breaking the deadlock and getting the two presidents back on the phone. Tillerson’s involvement in the issue is noteworthy because he pledged, in written answers to questions after his Senate confirmation hearing, to uphold the One China policy. He specifically rejected the idea, advanced by Trump, that Taiwan be used as a bargaining chip in a broader negotiation with China on trade and other issues. It is far from clear that Trump will agree to roll back his comments. In an interview with Fox News in December, he said the policy should be contingent on extracting other concessions from Beijing. “We’re being hurt very badly by China with devaluation; with taxing us heavy at the borders when we don’t tax them; with building a massive fortress in the middle of the South China Sea, which they shouldn’t be doing; and, frankly, with not helping us at all with North Korea,” he said. Since his inauguration, Trump has spoken by phone with about 20 foreign leaders. Although these calls are typically highly scripted affairs, Trump’s have been anything but. His conversation last month with Prime Minister Malcolm Turnbull of Australia turned contentious when Turnbull urged Trump to honor an agreement made under President Barack Obama to accept 1,250 refugees from an offshore detention center. But arguably no bilateral relationship is more important than the one between Beijing and Washington, and the fact that Trump and Xi have not talked since Trump took office in January has drawn increasing scrutiny. Administration officials are also keenly aware that the Chinese will be closely watching the visit of Prime Minister Shinzo Abe of Japan, which begins here Friday with an Oval Office meeting, a White House lunch, and a joint news conference. Then Trump will take Abe to Palm Beach, Fla., on Air Force One, where the leaders plan to play golf at Trump’s club. They and their wives will also have dinner at Trump’s club, Mar-a-Lago. To the status-conscious Chinese, this red-carpet treatment will not go unnoticed. Analysts say it may reinforce their suspicion that the Trump administration is making Japan the centerpiece of its Asia strategy. In Beijing, Lu Kang, a spokesman for China’s Foreign Ministry, expressed thanks for Trump’s letter. He dismissed as “senseless” speculation that Trump was snubbing Xi by not scheduling a phone call. “The two countries share wide common interests, and cooperation is the only correct path for both,” Lu told reporters on Thursday. Even without a phone call, Trump and his advisers have markedly shifted their tone toward China since the inauguration. During the campaign, Trump advocated a 45 percent tariff on Chinese exports to the United States, complaining that China manipulated the value of its currency. Last week, however, the president’s daughter Ivanka attended a Lunar New Year celebration at the Chinese Embassy in Washington. Her daughter Arabella sang a New Year’s greeting in Mandarin that was widely viewed in China. Ivanka Trump’s husband, Jared Kushner, who is a senior adviser to Donald Trump, met with Cui before the embassy event, part of a blossoming dialogue between the two men. The business relationships between some of Trump’s advisers and leading Chinese companies with close links to the Communist Party may also help strengthen ties. Kushner took part in talks last year with Chinese billionaire Wu Xiaohui about helping to redevelop the Kushner family’s crown jewel, a commercial building on Fifth Avenue.